On My Way Hostel was a concept formed by a group of Taiwanese backpackers, which is in a simplicity town, not crowd downtown, in order to let people relax to see Taiwan own culture, nature landscape and enjoy hot spring easily. On My Way Hostel offers 2, 5, 6 and 8 people dorms, even female only floor. 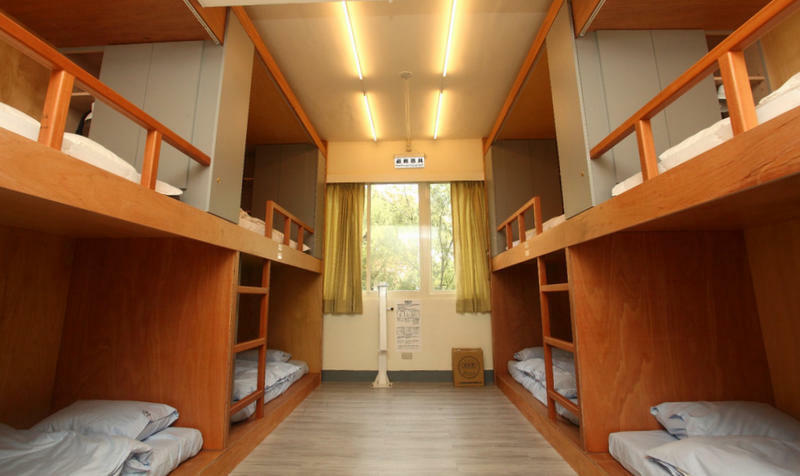 It also provides personal luggage locker, cabinet, outlet, bed lamp and curtains around most of beds, which is treated like a personal own room to have privacy. New bedclothes are basic necessity the hostel will offer, no need to carry sleeping bag by self. The luggage elevator has been installed to carry the big luggage going through all floors. 1F and B1F are public area that guests can sit lazily on the sofa, fully relax to share travelling experience with all backpackers; and WiFi, air conditioner and tea bags are free offered as well. In order to satisfy all needs of everyone,we also provide different kinds of books to read, play movie and hold the lecture of culture exchange from time to time. The roof is another special public place where has deck chair, outside chair set, guests can have a coffee on sunny day with fresh air. The hostel location with life of convenience is purposely to be selected. It takes red line and passes through 12 stations to arrival MRT Beitou station. After exit, please turn right and follow the only road (Guangming Rd) to walk about 3 minutes, you will see On My Way international hostel on your right hand side.There are elementary school and police department opposite of our hostel and one breakfast shop near to us. If you would like to experience the bus in Taiwan, the 218 bus can be taken from Taipei main station and will spend you about 40 minutes. If you really scare to lost, or you are not near any MRT or bus station, you can take taxi and tell driver to MRT Beitou station or our address, we can send people to pick you up in MRT Beitou station. Head to bus platform and take Kuo Kuang Line 1819 to Taipei Main Station. The bus fare is NTD 125 and takes approximately 50 minutes to reach Taipei Main Station. Head to taxi station outside airport arrival hall to board taxi. You can tell the driver to MRT Beitou station, and then ask driver to reach No.82, Guangming Rd. when you are near.